This fat lady can walk Hadrian’s Wall! – This fat lady can walk! This fat lady can walk Hadrian’s Wall! 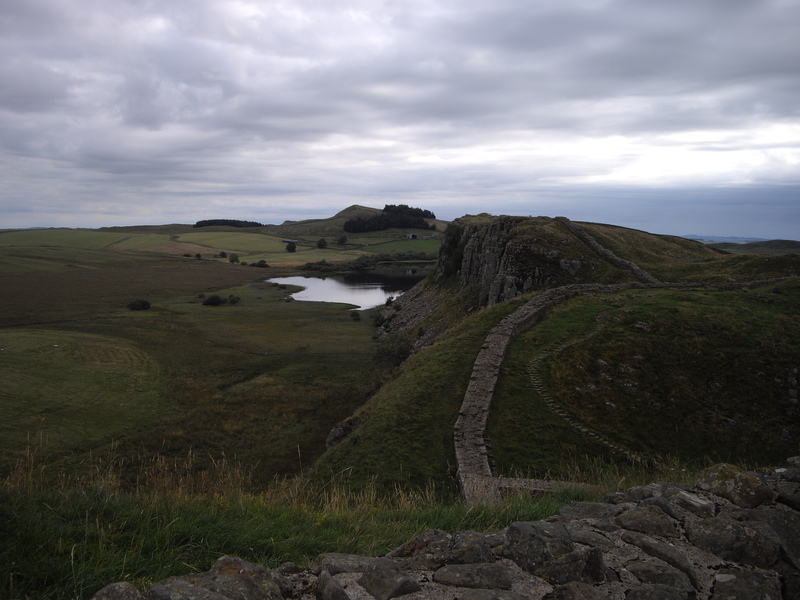 Just over a week ago at around 1pm I walked into Newcastle to complete my first long distance walk, Hadrian’s Wall. I was now fit enough to walk 11 miles before lunch. My feet and legs felt very tired and I knew I could do no more that day. After a hot bath though and a good sleep the following morning I felt fit again. I knew I could have physically continued if the walk had been longer. I had walked 88 miles from Bowness on Solway to Newcastle over 9 days. I did not find this a particularly difficult walk….if you take one day at a time. Although in the back of my mind I kept Newcastle as my aim I deliberately only concentrated on what I was doing the next day. Every evening I sat and read through the instructions for the following day. Unless you have a medical problem I think after a bit of preparation that each day individually would be achievable by most. I never pushed myself beyond what felt comfortable. Even over the crags and the highest section of the wall. You do have to constantly go up and down fairly steep hills but they are short ascents before you start downhill again. You can do most things for a short time. As with all my walks I counted the steps. Before I started the hill I would gauge whether I felt I could go for 25 steps or even go for 50. Either way I stopped briefly whenever I reached that number, had a look at the view so I could catch my breath back. There was one section I had to do 10 steps before stopping. I still got to the top! The difficulty with this walk is that it is day after day. That comes with practice but you can walk what feels comfortable for you and just take a longer time to complete the walk. Or you can just do a highlights version of the walk. A majority of the walk is fairly flat. I did the high sections over two days to make it easier on myself. In my preparation for the trip I planned to walk between 10-11 miles a day with a rest day mid trip and I deviated off the route to go into Hexham. On my first main walking day as planned I carried my rucksack. For the first 2 miles I kept stopping to take the strain off my back. I didn’t practise my walks with such a heavy rucksack. Despite that I soon found my stride and walked the 9 miles into Carlisle by 2pm. I was desperate to get the pack off and here made one of my first mistakes. Hot, dehydrated and tired as soon as I arrived at the guest house I had a hot bath. It took half an hour at least to stop feeling dizzy. You just don’t realise how dehydrated you can become. I carried 2 bottles of water with energy tablets in plus a small flask of coffee. After that day I made sure I drank them all before going anywhere near a hot bath/shower. The owner of my first bunkhouse recommended I arrange a carrier to take my pack particularly over the high section. I rang the company she recommended and arranged it for the rest of my trip. It cost £6 a transfer which I was more than willing to pay after that first day. I cannot stress enough how important this was for me. I do not think I would have completed the walk without doing this. Freed from my heavy bag I set off the next morning feeling happy and confident that the trip was now achievable. One problem I didn’t anticipate was arriving too early to get in my accommodation. I found those that allowed me in at around 2pm were ideal. That fitted in with my walking; gave me plenty of time to rest and recharge my batteries before the next day. I stayed at one bunkhouse where you aren’t allowed in before 5pm. whilst it was a lovely place to stay I would have chosen differently in retrospect. I spent most of that day hanging around waiting to get in. That isn’t relaxing at all! Along the Wall there are no cash machines other than in Carlisle and Newcastle. Normally not a problem except that many of my bunkhouses and places for snacks did not take card payments. On reaching Birdoswald I had very little food so having established they accept card payments I settled into their cafe. Lack of food was often a problem for me. I had not taken enough with me and it was only towards the 2nd half of the trip I realised you have to eat when you pass somewhere with food even if it’s just for a scone because you don’t know when you’ll pass somewhere again. There were very few days i found enough food for three meals a day. After discussing this with other walkers it seemed that most carried loads of energy bars. I hadn’t even thought of it. I was very fortunate with the weather generally but one day the rain started around midday. I was not quick enough putting on my waterproofs. That was an extremely uncomfortable 5 mile walk in the rain. However on arriving at the bunkhouse and having downed two cups of tea I realised that I was one of the few walkers there without blisters or injury. I had come across people giving up or injured along my route. All of these walkers were walking much further every day. This is why I felt I planned it right. My plan allowed me equal walking and rest time and well within my walking abilities. Additionally I had taken my old well-worn in boots and wore 2 pairs of socks. Old style! The views on the walk are varied. The sections with visible wall and in parts the highest from near Birdoswald to around about Housesteads were beautiful. I often stopped to take in the view and appreciate how far I had come and still had to go. The section prior to Carlisle and going into Newcastle does have quite a bit of road walking which isn’t my favourite but even here you are overlooking their respective rivers Eden and Tyne most of the time. You meet a great variety of people on a walk like this and many will stop for a chat if you want to. I particularly remember some of the people staying at the bunkhouses I stayed in. If you were going the opposite direction they would ask the path you taken, what was it like. If you were with people going the same direction was more a case of comparing blisters….which I didn’t have! I did meet a few other solo women walking but the thing that probably surprised me more was the average age of the walkers I met. Whilst there were a few younger groups most of the people walking were I would say between 50 and 70 years old. In fact I met a few rather elderly people up on the high section and I was amazed at how they got up there! A week on and my thoughts have turned to other long distance walks I could do. I read somewhere that you can get hooked on this long distance walking lark and I think I am. I had a great time and really enjoyed the experience. I was more than happy walking on my own although I appreciate that not all long distance walks might be quite so easy on your own. . My experience of bunkhouses was fine as well as everyone else is there because they are doing what you are. My rest day didn’t quite work out as I planned as I changed accommodation that day so yet again a day spent sitting around. Still I learn a lot from this trip that will prepare me for any further ventures. I am proud of myself for this achievement. Not bad for someone with my BMI. I did lose about a stone immediately after the walk although some of that was definitely fluid. I am still about half a stone lighter now. All that exercise mind you and I still get breathless going up the stairs!